National Day in Bhutan is celebrated on December 17, it commemorates the coronation of the first Druk Gyalpo (Dragon King) of modern Bhutan. Bhutan's most significant national holiday is widely celebrated throughout the country. 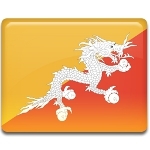 The Drug Gualpo is the official title of the head of state of Bhutan, it is translated from the Dzongkha language as “Dragon King”. Modern Bhutanese monarchy was established in 1907 by the Wangchuk family. Ugyen Wangchuk reunified the country and was unanimously chosen as the hereditary monarch of Bhutan. His coronation took place on December 17, 1907. Ugyen Wangchuk founded the House of Wangchuk, that has ruled Bhutan since its a reunification. Once an isolated country, the kingdom of Bhutan is now on its path toward decentralization, democratization and sustainable development. National Day of Bhutan was established to honor Ugyen Wangchuk and his contribution. It is observed across the country, but the main celebrations are held at Changlimithang Stadium in the capital city of Thimphu. They include a public address by the incumbent Druk Gyalpo and a procession. During the procession, a statue of Ugyen Wangchuk is carried to honor the first Dragon King of Bhutan and the independent Bhutanese nation.